Home CS:GO Featured News Steam updates Is Counter Strike : Global Offensive dying? Is Counter Strike : Global Offensive dying? Let us start with the Steam Stats. Since few years we have seen Dota 2 to be the most played game on Steam; which is followed by Counter Strike : Global Offensive, the second most played game on Steam. Nothing had beaten these two games in the past years until few weeks ago when PLAYERUNKNOWN'S BATTLEGROUNDS came into action. 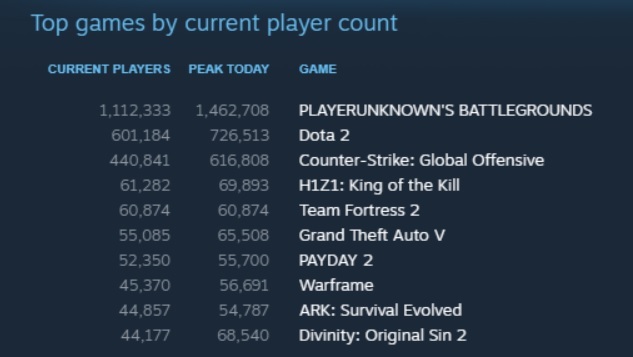 PUBG not only became the most active game played on Steam but also it broke the all-time record of Dota 2 with almost 1.35 million concurrent players! We cannot directly compare PUBG with Dota 2 and CSGO as these three games are entirely different than one another. Yet Steam Stats are enough for us to conclude that PUBG is favored more by players. Stats perhaps do not indicate that any of these games is better than the other. It is just the active number of people playing that particular game. A decent and casual game to have fun with friends. It has lesser stress than CSGO competitive MM. There is randomness and we can play with all our friends irrespective of skills! Fun fact is, Dota 2 players are still playing Dota 2 but majority of CSGO players have disowned CSGO and shifted to PUBG. To be honest, CSGO community is annoyed by Valve's way of treating CSGO. 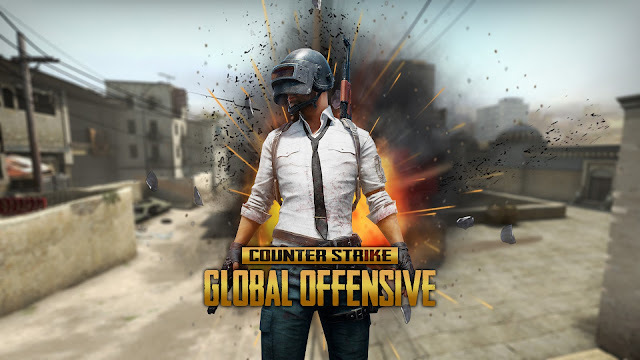 Remaining players cannot switch to PUBG as the game requires a good PC configuration to run. All of us know that CHEATERS are one of the main reasons why CSGO is dying. Non-Prime Match-Making is a joke! Out of 10 matches, we find ourselves dealing with aimbotters, wallers and spinbotters in almost 6-8 matches. Oh and toxic teammates, smurfs or really noob teammates! Prime Match-Making also has Cheaters nowadays, especially in ranks above LE. Talking about VAC, the anti-cheat which is more useless than PP-Bizon in the game! Recently in August 2017, Valve VAC banned 1,85,000 users and everyone was pleased. It was one of the biggest VAC wave in recent years. People thought that VAC is more secured now but within 2 days new hacks were introduced which ruined the game again. Cheaters force away legit players from the game. Some people start cheating due to other cheaters, which increases the number of cheaters. This decreases the genuine player base overall. Higher Ranked players stop playing in their rank and start smurfing to have fun as they can't have in their ranks because of cheaters. Due to smurfs new players face many problems in playing the game even though smurfs are 100% legit and not cheaters. This potentially affects the new player base. As new players avoid buying or playing CSGO, the statistical growth of game becomes negligible. Cheaters ruin the game on all the ranks. Smurfs ruin the game for lower ranked people. So new players do not play or buy the game. The game is dying due to this scenario. Although cheating is not the only reason for players to shift to PUBG or leave the game anyway. The community of CSGO itself is responsible for the downfall of the game. CSGO has become a business game. People like to play with skins more than playing with stock rifles. This gives Valve a chance to introduce new stupid cases, skins, gloves and what not. Another thing which is causing CSGO to its downfall is account boosting and account trading. It is illegal to sell, buy or trade Steam accounts in any way. But who cares if the community itself is earning with it? Boosting is one of the reason why cheaters and smurfs play the game explicitly! We blame Valve for everything what is wrong with CSGO but we also do things which are wrong. Consider Gambling and Case Opening websites. Those websites are rigged and we still bet on them and open cases. Do not watch Gambling videos on YouTube as YouTubers are paid to make such videos and they earn as we use their referrals. 55% of PUBG players are from CSGO. Valve doesn't care if people play PUBG more than CSGO. 30% of money goes to Valve when PUBG is purchased on Steam. Valve also receives incentive from the in-game items of PUBG. So if players quit CSGO and start playing PUBG, Valve still has its pockets filled. Unlike Dota 2 vs League Of Legends, PUBG is not a competition for Valve. Valve focuses more on Dota 2 as it has a competitor outside steam. survival of the game in an unwanted way! People still love CSGO but they don't find it worth playing due to all the reasons mentioned above. CSGO-China is better than the CSGO we have. Atleast when it comes to cheating, the Chinese don't forgive easily. Chinese servers are better than the servers we play on. We need to have 128-tick servers for better performance. A strict Anti-Cheat and no stupid franchise updates! I personally think Valve would do anything else than adding CSGO franchise until the game is eventually DEAD! I dont think that Global Offensive is dying, at least I dont notice this processes. I know a lot of people who still play in this game, and moreover make some purchases in game, for example skins buy https://skinsmarket.com/ on this service, that have only the best and the latest skins for all guns and tools in the game. Browse and play mods created for Stellaris at Mod DB.